Lots of people know Gloria Vargas (below left) from her long-running gig at the Beaverton Farmers' Market, dishing out signature Salvadoran-style tamales with their sensuous banana leaf wrappers and lighter-than-air cornmeal filling wrapped around fall-apart tender chicken, pork or vegetables. But even area locals haven't picked up on the fact that just blocks away lies Gloria's home base, from whence flows her market goodness. From the outside a cheery storefront with café tables and flowers on the sidewalk, step inside Gloria's Secret Café and you're instantly transported to sunnier climes with intriguing aromas of chiles and spices wafting through the air. 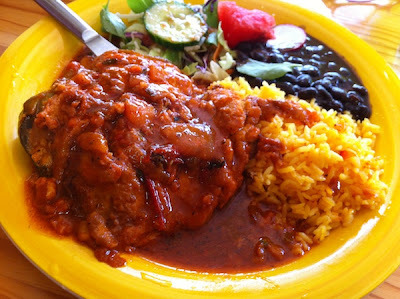 Salvadoran cuisine, while not spicy hot, still has the signature complex mix of herbs and spices found in most Latin cuisines. Sauces often contain dozens of ingredients, and can take a couple of days to simmer to perfection. My luck was on overdrive when I stopped in for lunch the other day, since Gloria was featuring Salvadoran chile rellenos (top photo) as the daily special. Made with green bell peppers rather than the more typical Anaheim or poblanos, she somehow roasted them so that instead of having an acidic bite they had a sweeter, fuller character. Stuffed with long-braised, fork-tender pork and covered with an intriguing chunky tomato-based sauce, every forkful caused my eyes to roll back in my head. 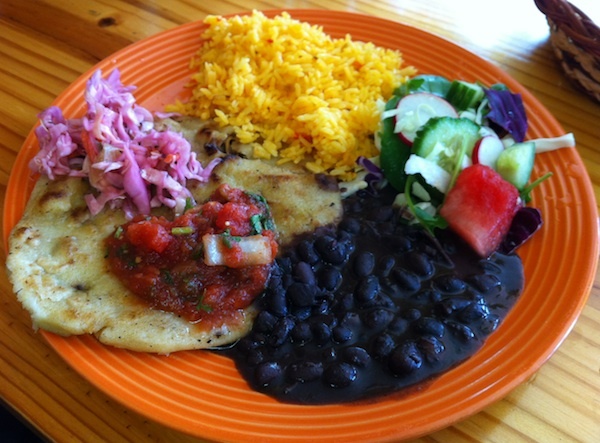 The brightly colored plate also held Gloria's outstandingly flavorful black beans, a beautiful serving of saffron-colored rice and a small vinaigrette-infused salad of seasonal greens. If this dish is on the menu when you go, order it immediately before someone else takes the last one…it goes quickly and when it's gone, it's gone. My friend's pupusas (right), essentially a layer of meat sealed and pressed between two masa pancakes, were the best I've had of this quintessential Salvadoran dish, with their fresh corn flavor, rich filling and the lightness that comes from skilled, caring hands (any hint of oiliness or overcooking can make these heavy and tough). These were accompanied by the same terrific beans, rice and salad that I had, along with the traditional sides of quick-pickled cabbage and a tangy salsa. If there's any better, fresher Latin food in town, especially at such reasonable prices, I have yet to find it. And with authentic Salvadoran cuisine in short supply in Portland, it's definitely worth a quick trip out to the burbs for lunch. I'm intrigued by Gloria's dinner offerings, which are only available by calling ahead and making a reservation…I'll be sure and report back when I do! Details: Gloria's Secret Café, 12500 SW Broadway St., Beaverton. 503-268-2124. I've never had Creole food straight from the source. My exposure has been limited to what's available in the Northwest, so I wouldn't know an authentic jambalaya if I tripped over it on the sidewalk. But I trust contributor Jim Dixon of RealGoodFood to point me in the right direction, since he's a regular habitué of the Big Easy. For years my go-to rice was Calrose, a medium grain japonica rice developed in the 1940s for California rice growers. But while I’d always been troubled by the nutritional void of white rice, I’d never found a brown rice I liked as much. 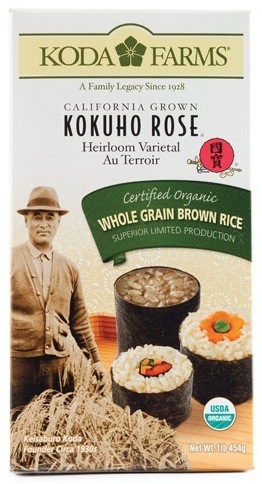 Then Albert Katz introduced me to Koda Farms incredible heirloom rice, Kokuho Rose. Like the other products I sell, I eat it all the time. But because of the longer cooking time, I’d never used the Kokuho Rose brown rice, also a medium grain japonica, in dishes where it cooks in some kind of flavorful sauce. And I couldn’t find a source of reliable information for using it that way. So I tried a simple experiment. I made jambalaya. 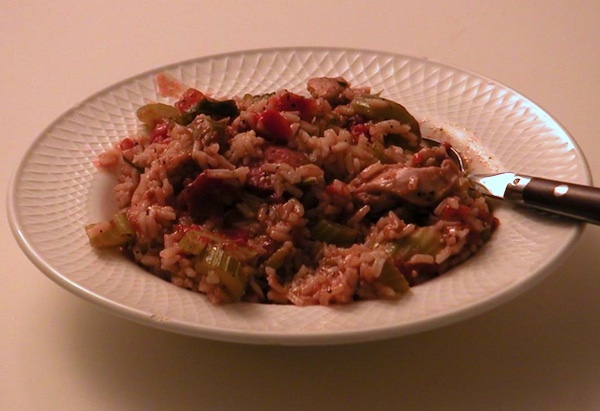 The basics of this traditional Creole dish are simple: make a tomato sauce using the aromatic “trinity” of onion, celery and green pepper, use some hearty seasoning, cook at least one but more often several forms of animal protein in the sauce, add rice and either stock or water, and cook until done. First I cooked chopped onion, celery, and green bell pepper in extra virgin olive oil, added some crushed tomatoes and a bit of tomato paste, and a little Dulcet Creole seasoning. Into the sauce went slices of smoky andouille sausage and boneless chicken thigh; when those had cooked a bit, I added the rice. I’d soaked it for a half hour, then poured off most of the water. For each cup of dry, unsoaked brown rice, I added 1 3/4 cup water. I covered the pot, turned the heat down to simmer, and let it cook. After 45 minutes the rice was getting tender, but the jambalaya seemed soupy, so I let it simmer uncovered for a bit longer. I won’t claim this jambalaya is the same as you’d find on the Gulf Coast, but the rice was tender and it tasted great. Next experiment: paella. I've already confessed to being a cookbook addict, with shelves of titles from well-known authors like Diana Kennedy, James Beard, Marcella Hazan and Betty Crocker. Then there are those that cover cuisines ranging from Moroccan to Chinese to Latin American, and more that focus on a technique like pickling or grilling. And then, of course, there's the internet, with millions of recipes available at the stroke of a few keys. But, honestly, some of our best meals have come from random rummaging in the fridge and the pantry for something…anything…to make for (yet another) dinner. For example, the other evening I'd spent far too long bouncing around on Facebook or Twitter, trying to keep up with the endless conversations and very important links to the latest cat-in-a-box videos. Then I heard Dave's truck drive up outside and thought, Holy crap! Dinner! I ran to the fridge like some demented TV housewife, hoping that somewhere in it would be the solution to my family's evening repast. Now, it's not like anyone at our house gets bent out of shape having scrambled eggs or leftovers for dinner, but I do feel a certain obligation to put an at-least-decent meal on the table. After a few minutes I'd found a bulb of fennel and some spring onions from the farmers' market, and with chicken broth made from our last grilled roaster and some rice from the pantry, I had my answer. One that I think Di, Jimmy, Marcella and Betty would approve of! 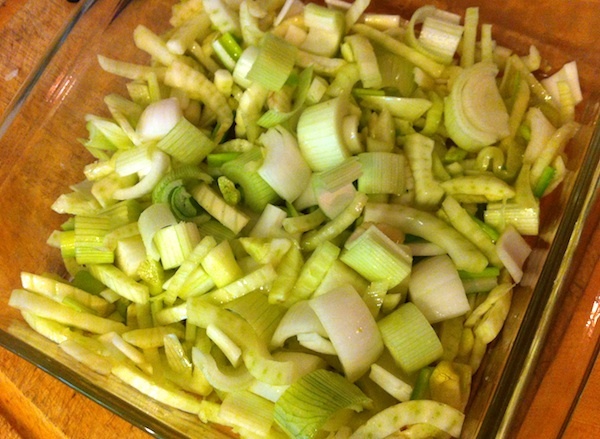 Toss chopped fennel and onion in 1 Tbsp. olive oil and a sprinkling of salt. Place in small roasting pan and roast for 20 minutes or until vegetables are slightly brown on the edges and tender. Over medium to medium-high heat, melt 2 Tbsp. oil and butter in medium saucepan. When it's bubbling, add garlic and heat briefly, then add rice to pan and stir till heated, about 1-2 minutes. Add fennel, tarragon and wine and stir until the liquid is absorbed. Add stock a ladle at a time, stirring after each addition until it is absorbed into the rice. After second ladle of stock, add the roasted vegetables. Continue ladling the rest of the stock, and when rice is still toothy, remove from heat. Add lemon zest, juice and parmesan and stir. 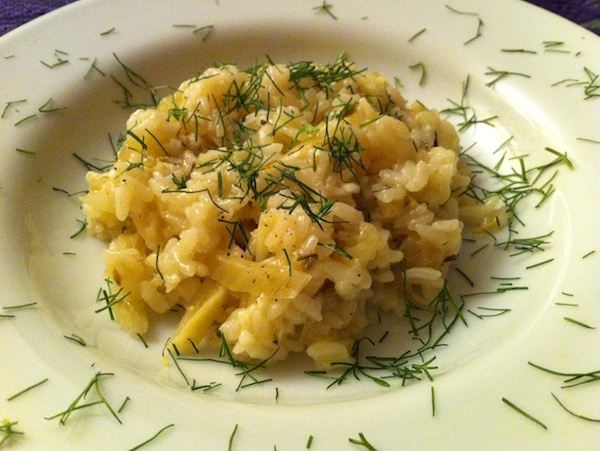 Salt and pepper to taste, then garnish with fennel fronds, if desired, and serve. Self-described "bookstore Buddhists," David and Tina Bergen of Dundee's landmark Tina's closed the restaurant and took a month-long sabbatical to reflect and rejuvenate. 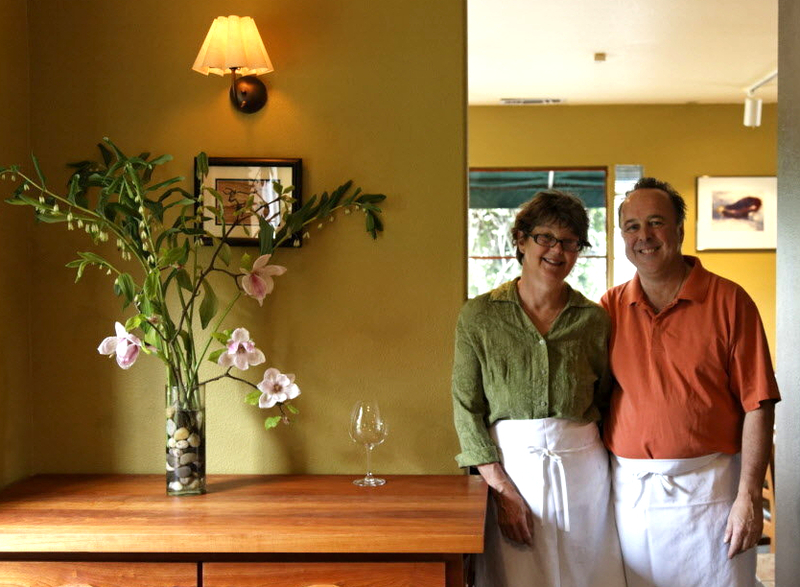 They returned with both personal insights—David's become a vegetarian—and with a renewed sense of mission to serve all of their customers the freshest locally sourced food and wine available, especially those with special dietary needs. Read my article in this week's Oregonian Spring Wine Guide titled Food for Thought: Tina's in Dundee. Photo by Beth Nakamura for the Oregonian. 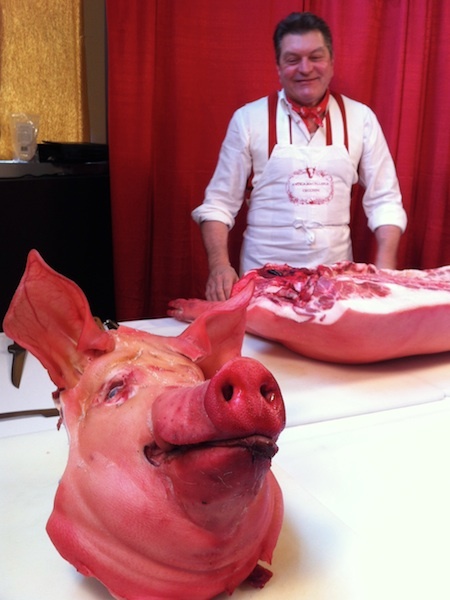 My profile of storied Italian butcher Dario Cecchini and his recent trip to Portland appears in this week's FoodDay section of the Oregonian. 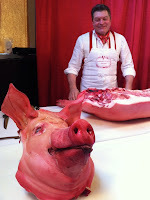 Cecchini said of this shot, "Two pig." There was so much to this story that I couldn't squeeze into the article, so I hope to post about it in the future. 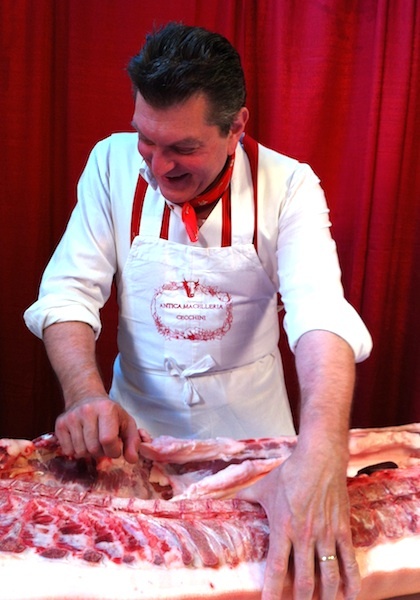 But for now, you can read what I think of as Part One: "Portland Butchers Learn from an Italian Master of the Craft." With salmon filets and steaks running up toward twenty bucks a pound at the fish counter, this time of year, when I'm craving it, I buy the whole fish, head on, for much less per pound. This way you get the (cleaned) fish, which you can throw on the grill with herbs and lemon stuffed into the cavity. You can also have your fishmonger filet it, or you can slice it into steaks yourself. But any way you choose to cook it, make sure to save the head, fins and tail to make a terrific fish broth for your next risotto or paella. Cake for breakfast? Oh, yeah! With out-of-town friends coming over for dinner, and wanting to share some of the crazy goodness of the Northwest, we grilled a whole salmon with a side of wild mushroom risotto and a salad of seasonal greens. Throw in some local red to go with the fish, a fruit crisp made with the last of the frozen berries to top off the meal, and they were putty in our hands. Even with everyone eating their fill, there was a good amount of fish left over…which fit into my clever plan to make salmon cakes for dinner a couple of nights later. These cakes are great as an appetizer or with a salad for a simple dinner, and they also make a great breakfast with eggs, sautéed greens and a slice of homemade bread. It's not necessary to have all the ingredients—the fish, mayo and eggs are the critical ingredients—so the seasonings can go in any direction you desire. These are meant to be mostly meat, with just enough of the other ingredients to (barely) hold it together. And if you ever happen to have any leftover smoked salmon (does that really happen? ), that would be the gilding on this particular lily. Combine salmon with other ingredients (except oil) and mix thoroughly. Form into loose cakes about 2" across. Can be refrigerated at this point, which will firm up the cakes a bit, but it's not necessary. Heat 2 Tbsp. olive oil in medium frying pan until it shimmers. Put cakes in pan, but don't crowd them—do them in batches if necessary. Cook until browned, then carefully flip them over and brown on the other side. Makes about eight cakes. The blueberries were the first to go in, a selection that included Duke, Blueray, Earliblue and a mature Bluecrop bush from a friend who was removing a few of hers. I'm hoping to baby the young bushes through the summer, though it'll be a year or two before they start to bear fruit. But we should be in for a haul assuming they all survive. 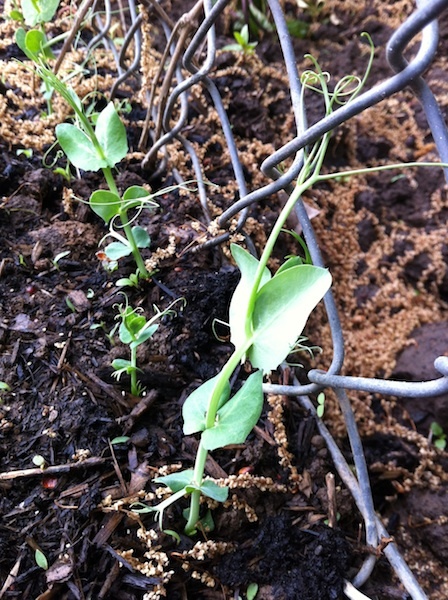 After getting the blueberries settled into their new homes, I poked sugar and snap peas along the chain link fence behind them. It took about a week, but with regular watering and a string of warm, sunny days, they began to pop out of the soil and wrap their little tendrils around the fence wire. This year I'm dedicating the raised beds to salad greens and carrots, planting rows of individual varieties rather than combining the seeds from the packets and sowing them in large patches. 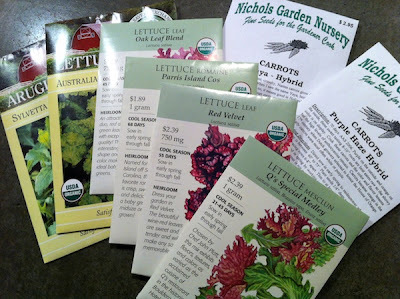 As usual, I got a little overzealous in my selection, ending up with mixed mesclun, arugula, two types of oak leaf lettuce, red velvet lettuce, romaine and a fascinating sounding Australian Yellowleaf. Who could resist? My plan is to pick the baby and mid-size greens to thin them, then let some mature into heads. About half the second bed will have eight rows of carrots, an orange Yaya hybrid that's purported to be sweet and crunchy, and a sweet purple variety called Purple Haze that grew well last year, tasted great and looked really impressive with other roasted roots. 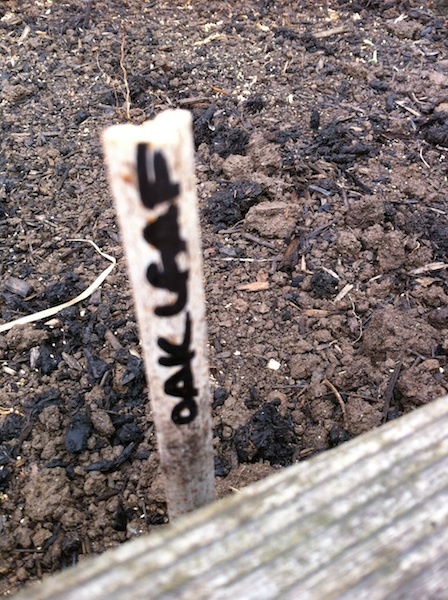 Coming soon will be tomatoes and kale, though they may have to wait till after the beginning of June to go in. 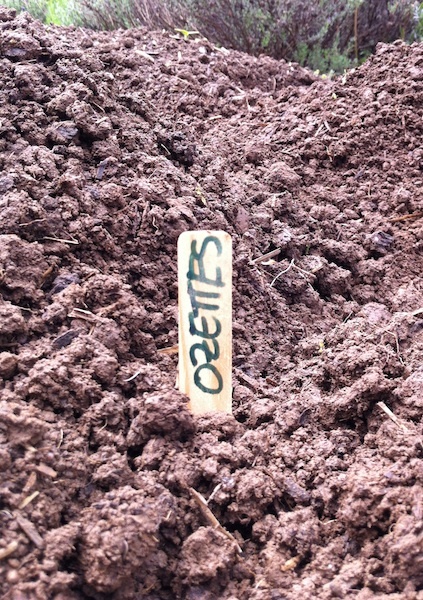 At least the soil will be warm enough by then…I hope! If you hear about raw milk, it's almost always portrayed as a fringe product consumed by wacko hippies who are just asking to get sick. In this video from a new series about local farmers and cooks called Food Farmer Earth, farmer Mike Guebert of Terra Farma Naturals in Corbett reviews the history of milk production in this country. From its roots in small farm-based dairies to its current state as a highly processed commodity with a hugely influential political lobby promoting it, I found his take on the subject riveting. In Oregon, raw milk can only be bought on the farm that produces it. And if you're considering consume raw milk, the best advice I've heard came from Clare Carver of Big Table Farm, a customer of Champoeg Creamery (see link below). 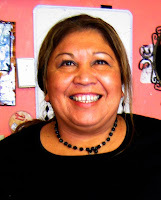 She said, "If you're going to buy raw milk, go to the farm and ask to see their operation." Asking questions is the key: find out what the cows eat, how they're treated and how clean the farmer's process is. Which, come to think of it, isn't a bad idea when it comes to the milk we buy in the store. You can also read about another small farmer, Charlotte Smith of Champoeg Creamery, who produces raw milk in St. Paul. Quite the explosion, isn't it? 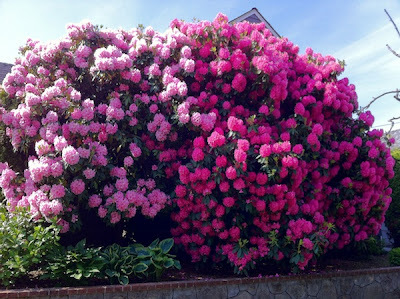 My neighbor JoAnn's 20-foot-tall rhodies are positively incandescent this time of year, and I get to enjoy them every time I look out my kitchen window. Lucky me! 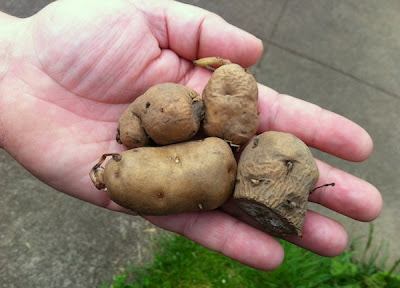 Sometimes I think contributor Jim Dixon of RealGoodFood has his booth at the PSU Farmers' Market for the sole reason that he gets first pick of all the newest produce as it comes in season. So if you see him there, be sure to quiz him about his recommendations while you peruse the Italian olive oils, vinegars, fennel pollen and particularly the addictive origano Pantesco (Italian oregano) he has on offer. The first artichokes of the year appeared at the farmers' market on Saturday, so I bought a bag of the little thistles from my friends’ at Groundworks Organics. When the globes are really young, the fuzzy choke is hardly there, so trimming them down to just the bottoms isn’t too onerous. It still takes some time, but I think the results are worth it and there should be still be plenty available for the next several weeks. Cut the top half of the baby artichokes away, pull off most of the leaves, split the artichokes from top to bottom, and dig out any fuzzy choke. 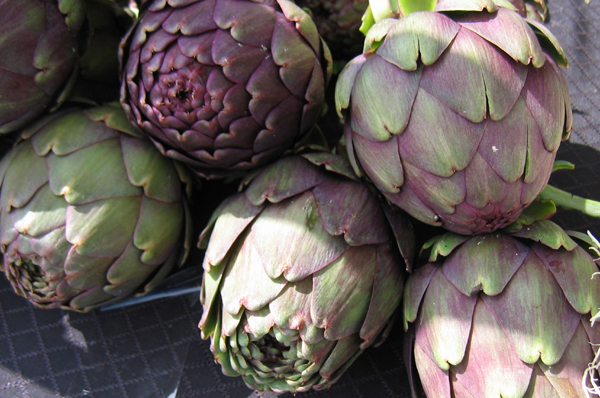 Most recipes call for putting cut artichokes into acidulated water (lemon juice or vinegar added) to prevent browning, but they turn brown when you cook them anyway, so I skip this part. Just put the trimmed artichokes halves in a heavy pan (one you can cover) with a good bit of extra virgin olive oil. Into the same skillet add a couple (2-4, depending) of the best anchovies you can buy (these at Gustiamo are the best I’ve found and worth every penny), cleaned if salt-packed, diced small. Also add a few cloves of garlic, diced, a couple of tablespoons of good capers (you can buy the Pantellerian capers from Gustiamo, too, until my load arrives), and a good pinch or two of origano Pantesco. Cook everything gently in the oil for about 10 minutes, then add about a quarter cup of water, cover and simmer for about 20 minutes or until the artichokes are tender. Good hot or at room temp. 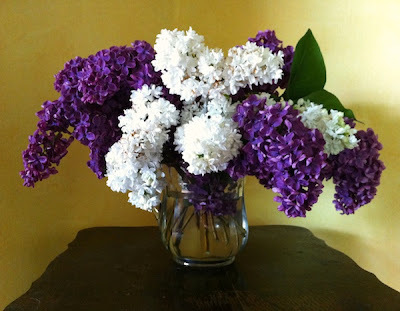 Every year my friend Maggie drops off a bouquet of lilacs when the prodigious bushes at her place are in bloom. 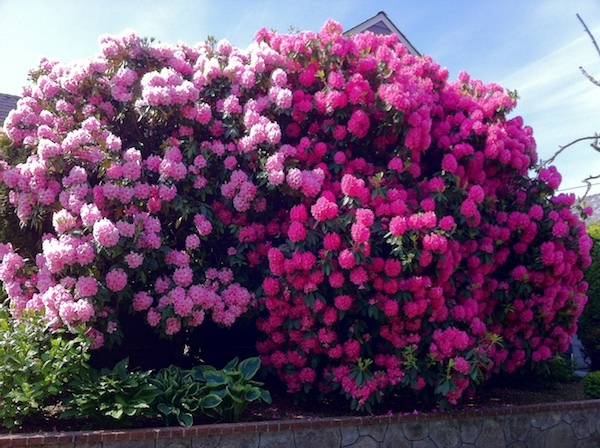 Today was the day for this year's blooms to arrive! Whether its miner's lettuce, nettles or fiddleheads, I just can't get enough of the first green things that pop out of the ground in spring. 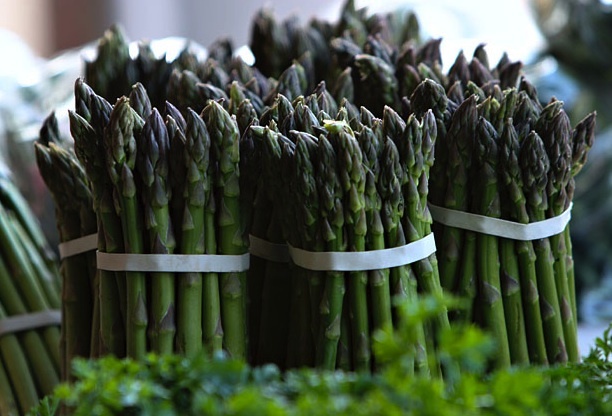 Call it months of chard or kale overload, but the appearance of the first rapini or asparagus at the farmers' market sings a siren song that has my feet dancing over and my hands loading my basket with them. The sturdier greens are perfect for grilling or blanching for dinner, and they're perfect for tossing into a stir-fry with rice or pasta. Plus I've finally started pickling some of them to enjoy later in the year with grilled and smoked meats or throwing into salads for a vinegar-y kick. 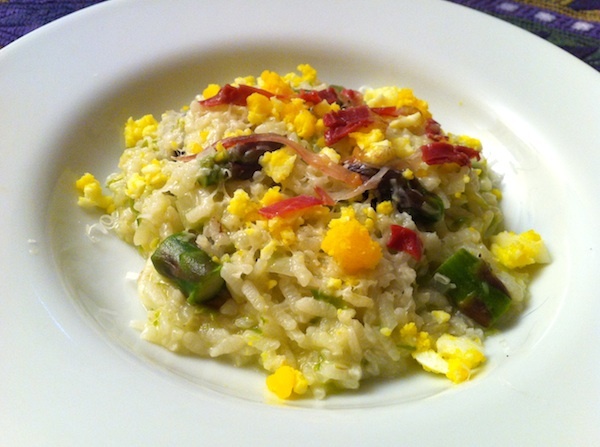 But right now I want them fresh, so other evening I made an asparagus risotto that featured the crunch of the bright green tips combined with the puréed stalks, which colored the creamy rice a lovely chartreuse. With a last-minute shower of crumbled hard boiled eggs and ribbons of duck prosciutto, I was sure I heard an echo of that irresistible song of spring. Bring a pot of water to a boil. Add the asparagus stalks and simmer until just tender but still a bit crunchy. Drain and immediately rinse under cold water. Put cooked asparagus in a blender or food processor and add just enough water to allow machine to puree until smooth; set aside. Put stock in a medium saucepan over low heat. Then, in a deep nonstick skillet, heat oil and 1 tablespoon butter over medium flame. When it is hot, add onion and garlic, stirring occasionally until it softens, 3 to 5 minutes. Add rice and cook, stirring occasionally, until it is glossy, about 2 to 3 minutes. Add white wine, stir, and let liquid bubble away. Add a large pinch of salt. Add warmed stock, 1/2 cup or so at a time, stirring occasionally. Each time stock has just about evaporated, add more. After about 15 minutes, add asparagus tips, continuing to add stock when necessary. In 5 minutes, begin tasting rice. You want it to be tender but with a bit of crunch; it could take as long as 30 minutes total to reach this stage. When it does, stir in asparagus puree. Remove skillet from heat, add remaining butter and stir briskly. Add Parmesan and stir briskly, then taste and adjust seasoning. Risotto should be slightly soupy. Sprinkle with crumbled egg and prosciutto ribbons. Serve immediately. If a food desert is defined as any area in the industrialized world where healthy, affordable food is difficult to obtain, it would make sense that a restaurant desert would be a place where there aren't many good places to find a meal. In the past, the town of Milwaukie on Portland's southeastern edge would have qualified, in my book, as just such a place. As far as I could discern, the opportunities for dining were very few, and the drive from our restaurant-heavy Northeast neighborhood seemed not worth the time or cost of gas. But now that Pascal Sauton, chef and former owner of the trés Français Carafe Bistro in Portland, has opened Milwaukie Kitchen, I may have to rethink my desert map. Needing a place to go for lunch with friends who live in the Sellwood area, we agreed to meet there and check out the scene. 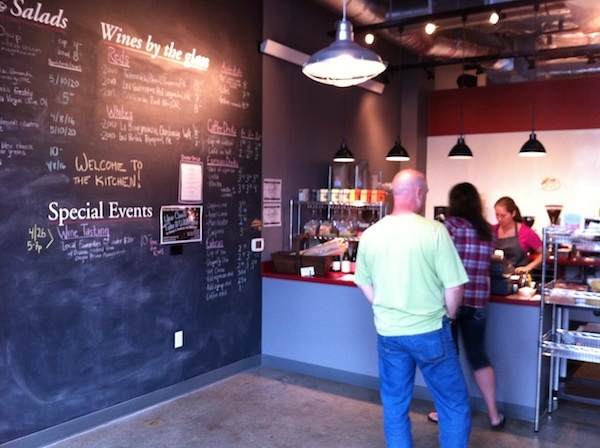 We walked into a bright and welcoming space, the day's offerings posted on a floor-to-ceiling chalkboard. The opposite wall was populated with a broad selection of wines from trés cher to not so, with other shelves lined with specialty grocery selections, mostly French and Italian with a nice representation from local producers, as well. 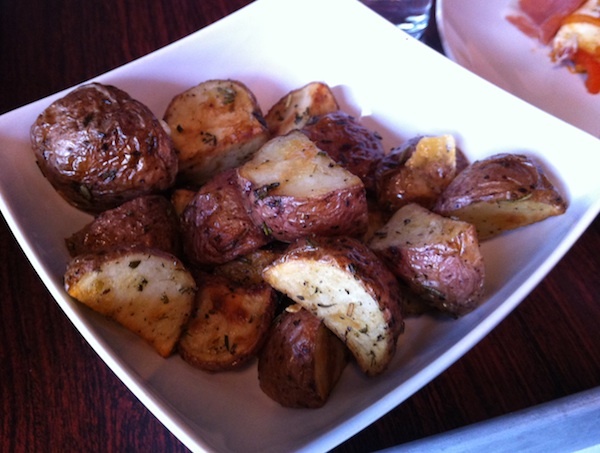 To-die-for duck fat roasted potatoes. Sauton, no fool he, has tailored his menu to fit both duck fat roasted potato-fancying foodies and those looking for a good, simple deli sandwich, with the devilishly clever ploy of offering breakfast items all day, always a good call. There are plenty of tables scattered across the floor for sit-down dining, but this place caters to the take-out crowd, too. As a matter of fact, dinner is pretty much strictly take-out, since the place closes at 7 pm. The dinner menu has some amazing sounding, and reasonably priced, dishes that had me considering putting together an easy evening meal for my family. Roasted lamb and pipérade sandwich. 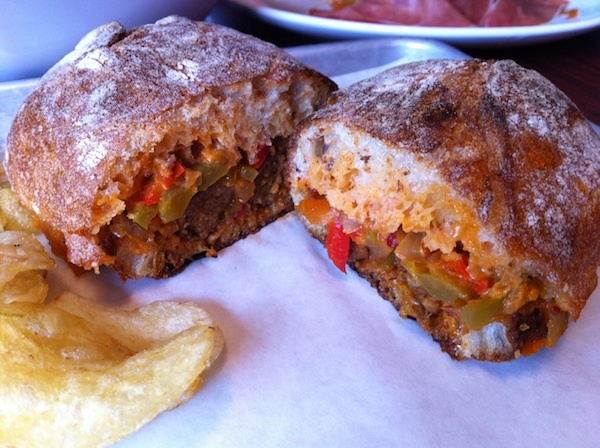 As for our order, my roasted lamb sandwich was comprised of a sturdy ciabatta roll that soaked up the juices from the meat and the roasted peppers with harissa mayo tucked inside. 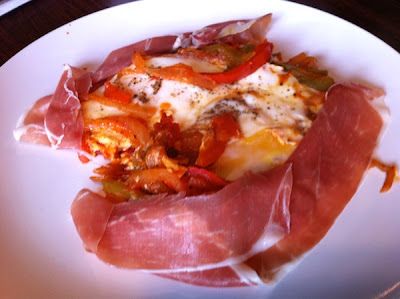 My companions chose to go with breakfast items, the first an egg pipérade, roasted peppers beneath baked eggs swaddled with two generous slices of serrano ham (top photo), something that has brunch written all over it. 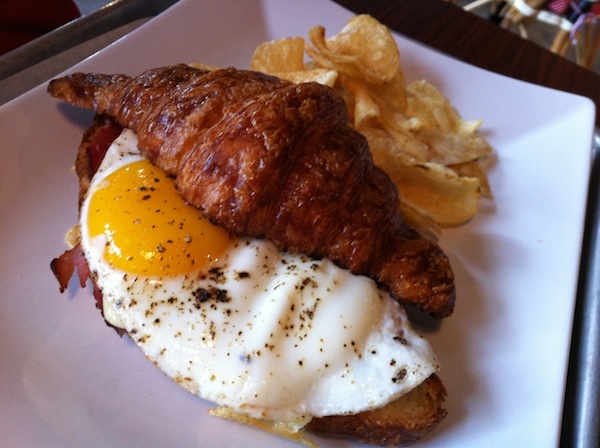 The warm croissant breakfast sandwich made from a Ken's Artisan Bakery croissant, white cheddar, Tails & Trotters smoked ham and a sunny side up egg is what other breakfast sandwiches, if they're very well-behaved, will get to be in heaven. 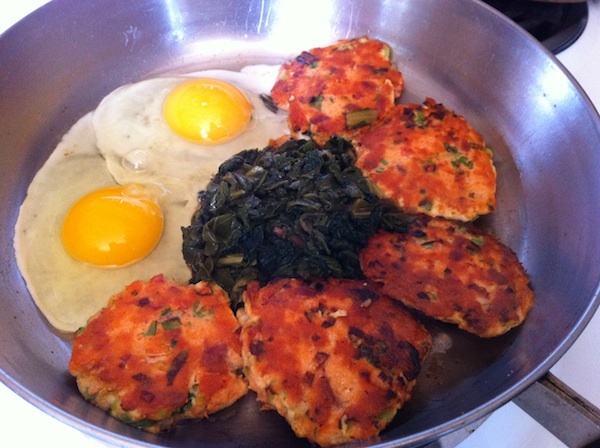 The egg is cooked just enough so it spills out over the pastry, making it fork-rather-than-finger food. But it's so good, who cares? With a place like this, and the wonderful Milwaukie Farmers' Market cranking up on Sundays, you can bet Milwaukie will be looking more like a food oasis than a parched desert. 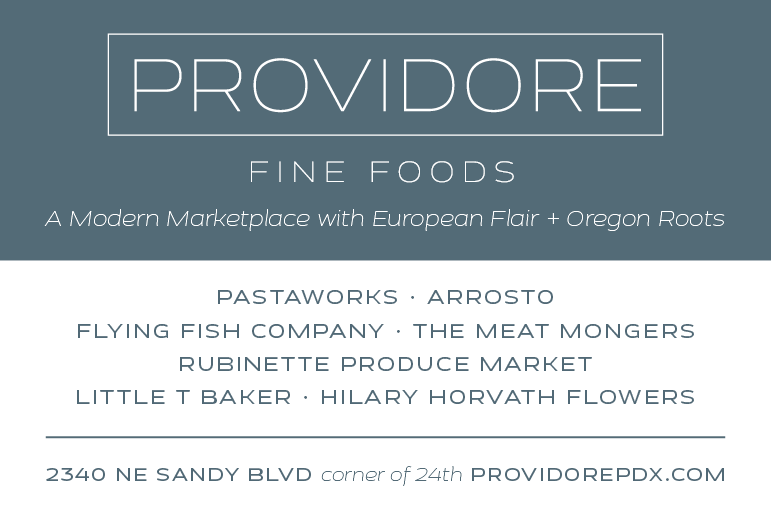 Details: Milwaukie Kitchen and Wine, 10610 SE Main St., Milwaukie. 503-653-3228. 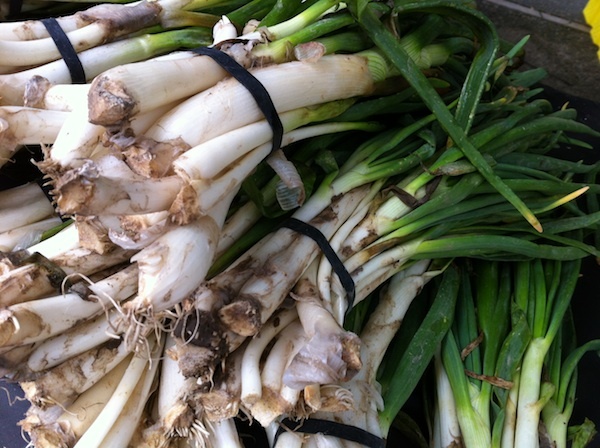 A specialty of the Spanish region of Catalonia, calçots (pron. cahl-SOH) are a variety of giant scallion known as Blanca Grande Tardana. In Spain they are harvested from November through April, and festivals known as calçotadas are held in towns all over the region. They are grilled over a hot fire, with the green tops laying outside the grill until the outer layer of the bulb is blackened. Then the calçot is lifted by the (cooler) greens, the charred outer layer is stripped off and the white is dipped into a bowl of a romesco-like sauce known as salbitxada (pron. sahl-beet-CHADA). The whole onion is then lifted into the air and the creamy inner parts are dropped into your mouth. Here in Portland, you can find these traditional tapas treats under the Viridian Farms tent at the Portland Farmers' Market at PSU on Saturdays. If they sell out, or if you somehow miss the season, you can use larger green onions cooked over your backyard grill, dipped into the traditional sauce below. To get in the mood for hosting your own calçotada, watch this temptingly luscious video. Makes 2 1/2 cups or 4-6 servings. Heat oven to 350°. Place almonds in hot oven to toast for 5-7 minutes. Place in a food processor or mortar and pestle and coarsely grind. Peel and dice tomatoes and set aside. Coarsely chop the peppers, removing the seeds and membranes. Peel and chop the garlic. Mash ground almonds, peppers and garlic into a paste using a mortar and pestle or food processor. Mix in tomatoes, parsley and vinegar. Pulsing the food processor, drizzle in the olive oil until sauce becomes thick. Add salt and pepper to taste. 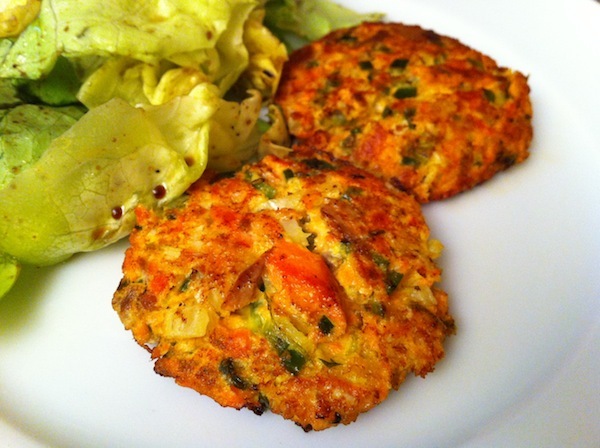 Serve with grilled “calcots” (green onions) or any other grilled vegetable. During summer months, consider serving this fresh sauce with grilled steaks.